Like mentioned in my post on update 9.1.0, it brought to the game the exciting new feature of Alliance Boss Battles. At the time of writing that piece, the feature had not been fully implemented yet, but it has in the mean time, and it is such an addition it merits its own article. So here, I will lay out all the necessary information you need about this feature. So, what are alliance boss battles? Basically, boss battles are prolonged battles which, for individual players, work similar to normal campaign maps; You click one, enter hero and troops, apply buffs if you want (you shouldn’t), press attack and voila. Difference is that you most likely will not kill the boss. In fact, you’re not meant to defeat them on your own. All alliance members can place an attack on a summoned boss, with any number of troops, to have a chance to get loot from him. Once he is killed, loot goes to the summoner and all players who attacked. And the loot is basically what you do this for, if not for teamwork. Similar to the Swift stones (troop training times buff) and artifacts I-X (defense/attack buff), a new fourth category of buffs has appeared at your city guardian: Gatherer stones, and they buff resource production. Where do I find the battles? You can find ongoing boss battles in your normal campaign screen. Press it and you will see a Boss Battle button on the top right. Pressing that will give you the list of open and defeated bosses, a claim rewards button, and options to attack a boss and get more info on a battle. Each battle has a named boss, which are all familiars from normal campaign maps. They have a certain level which corresponds roughly to the level of the campaign map from which they spawned. In the middle is stated who spawned the boss and who killed it (if it is defeated of course). To the right you can see how many alliance members already attacked it. This excludes the summoner. How do these battles work? You can enter or participate in a battle in two ways: spawn a boss yourself or attack an open battle yourself. As mentioned, attacking a boss works out the same as any attack in the game; press attack, select hero/troops/buffs and go at it. If you choose to attack an open boss, be selective. Look at your current level of guardian rss buff, and attack the bosses that net you the stones for the next level. This becomes quite apparent once you realize you can only attack one boss every 4 hours!! You can also press the little “i” button to bring up current state of affairs on a particular battle. Once opened, it looks similar to a normal campaign level screen. The boss is shown, along with the number of troops left. All alliance members can have a chance to attack him, and once defeated, all participants get rewards. It is therefor important, especially with the first lower bosses, to attack with small forces, so they aren’t defeated before everyone has had a chance to fight. Once it is time to finish a boss, go at full strength if you feel the need and haven’t participated in that battle yet. Note that boss battle last up to 7 hours max! So kill within 7 hours or no rewards! Don’t worry about sending large armies in this case; even if you do not defeat the boss in one attack (because these buggers are hella strong), you will not lose a full 100k t1 army on an attack. I attacked a lvl 120-160 with 100k t1, and killed a few hundreds, but also only lost something like 1k troops. So the game is specifically designed to allow and necessitate even multiple attacks from more members. How and where do you summon the Bosses? If you want to go the other route and summon, all you have to do is play campaign maps. Boss summons are random events which happen when attacking certain campaign levels. 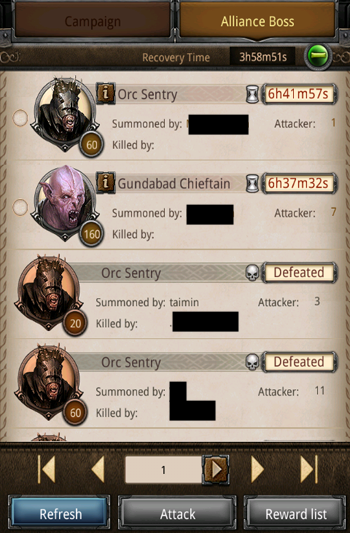 So far, my alliance has stuck to Clearing the High Pass, Avenging Moria, and Mirkwood, all with confirmed summons. I wasted a fair deal of stamina on Necromancer but got nothing. Once summoned, that particular level’s boss can only be summoned again once the old one is defeated. Within a campaign map, all parts and all levels can summon. I have had summons from the boss levels on Avenging Moria part 3, and from the very first level on part 1 of Clearing the High pass. Unlike attacking existing battles, summoning can be done as long as you have stamina points, no 4 hour cool down. Of course the assumption here that that level’s boss hasn’t been summoned yet by someone else. Who can summon the Bosses? Anyone! As long as that boss isn’t summoned yet, everyone can attack the campaign maps in order to have that chance summon. 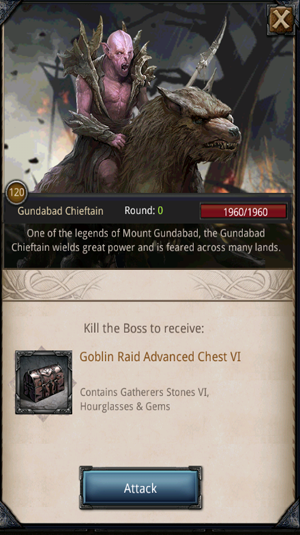 As mentioned, the primary rewards come in the form of chests which contain a certain level of gatherer’s stones, which you can exchange for Guardian buffs in the Guardian himself. Once a boss is defeated, you can claim the reward, and the chest will appear in your inventory along the other chests in your possession. Chests contain guaranteed stones for the guardian buff. Hourglasses, from the description, look guaranteed as well, but this isn’t the case. Especially lower level chests usually only contain stones. Other items include Vala Stones, which can be donated for the Alliance Shop. The summoner gets rewards no matter what if the boss is defeated. This is also the reason the summoner does not have to waste an attack on his own summon. For everyone else, participating members get rewards only if and when the boss is defeated, within the 7 hour period. Although the chests seem identical, it does appear from Kabam communication that the chests of the summoner and the person who kills the boss are actually of better quality compared to those who just place a small hit in. Where do which bosses spawn? So far only three campaign maps spawn bosses. Clearing the High Pass parts 1-5 drop Stones 1-5. Same goes for Mirkwood parts 1-5. 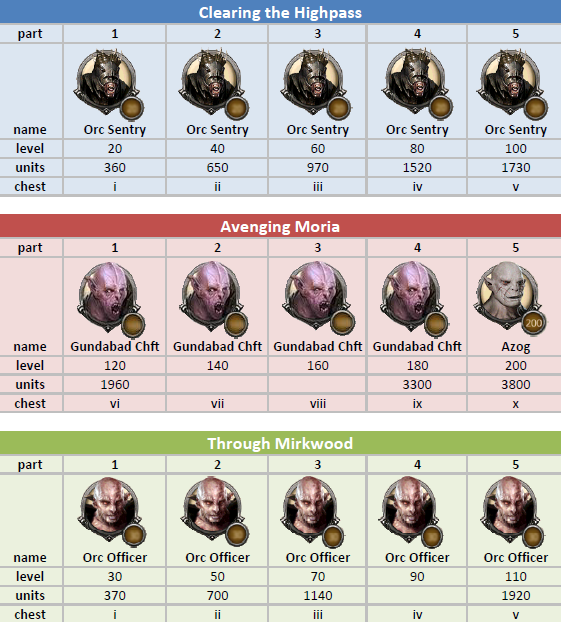 Avenging Moria parts 1-5 drop Stones 6-10. For each map part, bosses strength is reflected by the boss level of that parts boss map. Below is an overview of the bosses from several parts of the campaign. Missing maps will be included later on. Additionally, the new Lake-town campaign map spawns 210 and 250 Alliance Bosses, which drop chests which have a chance of containing Bard’s amulet and ring, as well as other items such as Orc Ears and Legendary pages. They do not drop Stones for the Guardian as the other bosses do. 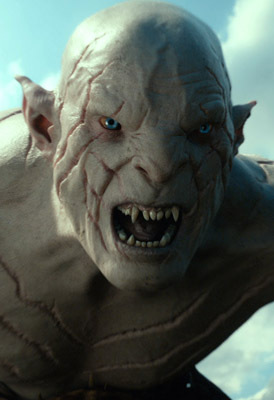 Although you can only attack once per 4 hours for free, you can buy an attack for a staggering 50 mithril….. The stones do not need to be converted in sage tower first. Higher level stones are currently invisible as long as your guardian is not at that level. i.e. If you need to do Stones 1, that number is shown in the guardian, but here is no way to tell how many level 2 Stones you have until you upgrade the guardian. Besides the above mentioned Boss battle list in campaign screen, individual boss battles can also be clicked at in the appropriate campaign map part from which they spawn. A new level icon is placed on the map with the timer next to it. So thats all I know so far about Boss battles. If I learn more, I will update this article, and in the mean time, if you have any additions, please comment below…. cheers!! This entry was posted in Alliance, Articles, Strategy and tagged Alliance, alliance boss battle, artifact, Avenging moria, boss, buff, campaign, city guardian, clearing the high pass, cooldown, gatherer, Goblin, guardian, Hero, hourglass, kabam, kingdoms of middle earth, KoM, loot, mirkwood, necromancer, relic, resource production, reward chest, sage tower, stamina, stone, summon, swift stone, teamwork, troops by beardmonkey. Bookmark the permalink. How many troops and of what kind do you recommend. Does gear matter or can I use my campaign hero. depends on your gear and level. Normally, one shotting a boss shouldnt be a problem with defense hero. However, the 250 boss is rather strong, such that some lower level players cannot kill it in one hit with defense hero/gear. I have it worked out and will post this info soon! Okay then, currently I can take out 210s no problem and can take out all but out 4000 left when hitting a 250. so what are you using to take out 250s? Do you have any numbers for Alliance Boss Kill Tourneys? Like How many points each boss generates? Do you have any stats on the Alliance Boss kill tourneys? We all know that a boss killed in one hit gives more pts than a boss with multiple hits. But what gives more points : a lv140 Boss with 1 hit or a lv160 boss with 2 hits???? I send only master rangers and can kill a 200 boss in 1 hit. I have full lv 10 void gear no runes needed. Looking for info on the quality of rewards in new gear upgrade drops from bosses when comparing a 1-3 player takedown vs. unlimited player takedown… Is having every ally send a cart a worth while endeavor, or does it just reduce the quality of the drops? Same question for me. Is the reward diluted by having more attackers. Drops don’t change regardless of how many ppl attack the boss but naturally the less hits it takes means more chests for your alliance. You can only hit every 4 hours, so If your whole alliance hits the same boss and only then someone kills it each of your alliance members only get 1 chest every 4 hours. If all your alliance members insta-kill the boss and immediately spawn a new one, it results 2 chests for everyone. One for killing, one for spawning. What is the exact benefit of the gathering stones? Yes, resource production is suppossed to increase but I don’t note a descernible difference. I also have minimal w, s & o fields(no wilds). Plus, my food production in my 3 “food” cities is just to “break even” (so my troops don’t gobble up all of the food I put there). What I’d like to do is to increase food production so I can reduce the number of farms. That should then allow me to increase my idle population and increase the number of troops I can train. Yes, realize what I am doing is unconventional. but, am I wasting time on obtaining gathering stones? Can you spawn bosses without an alliance? honestly no clue, but I wouldnt see why not. The ‘alliance’ part is attacking with more than one member, but individuals can summon, so my best guess is you can also without being in an alliance…just need to make sure you can finish the bosses on yourself, which is gonna be impossibly hard after the first few levels. I dont have a straight answer, but know for sure there is some weird math and/or mechanics behind these battles. As you state, if you send a large enough army, you both walk away with troops surviving. Plus, it is almost impossible to kill even the smallest of bosses in one attack. Yeah it does thanks. My alliance sent a couple attacks at a boss and by the time I hit he was 12 killed about 1k of my troops left 3k standing and left with 4. We were all shocked. I think its like there’s only one round of attack/defense so all teamates can attack at least once and as you say the boss will survive, in most cases, a single attack. 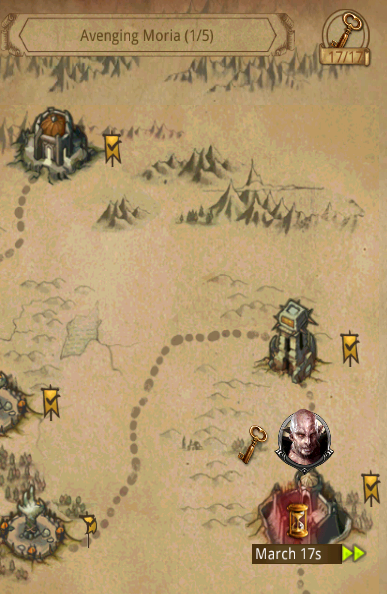 Do you need to attack only the boss on any given map, or is it any part of a map that can spawn a summons? Yeah so I have noticed, but saying it is just T4 is insufficient, because they also get some crazy bonuses, not only from boss level. I once attacked with 20 T5 against one of the low level bosses and killed nothing, which doesnt really make sense..Ill add it to the article, thanks!